Colors White, green, blue, yellow, etc. Delivery Within 15-25 days after got your deposit. 2. Shipping:usually 18-25 days after receiving your deposit. negotiate for urgent order. 2. Made of high quality plastic material. 3. Light, soft and comfortable. 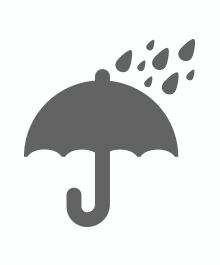 Stored in dry, humidity below 80%, ventilated, non-corrosive gases warehouse. 1. 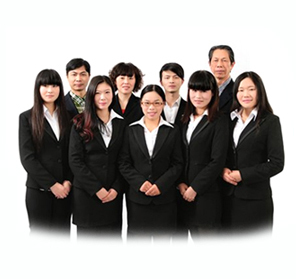 Xiantao Lingyang Plastic Co., Ltd is a leading manufac turer of disposable nonwoven medical products and pro tective products in China. 2. Alibaba assessed 5 years Gold Supplier. 3. Different design of products is available on your request. 5. 100% quality control before shipment. 1. Payment: T/T, L/C, Western Union, PayPal; 30% deposits; 70% balance before delivering. 4. Package Information: 1 pc/bag, 50pcs/ carton. 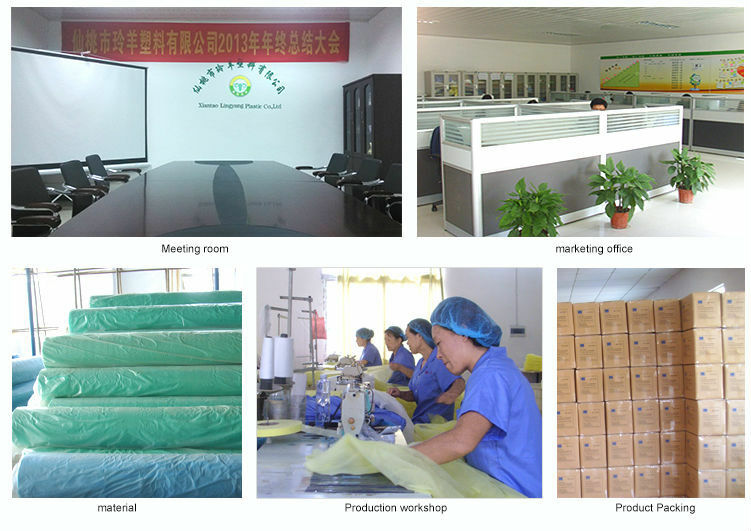 Our Products used for medical, general industry, home care, food processing, hospital, manufacturing, construction. A: Our factory is located in Xiantao (China's largest production base of non-woven products), only 35minutes train to Wuhan. You can fly to Tianhe Airport. 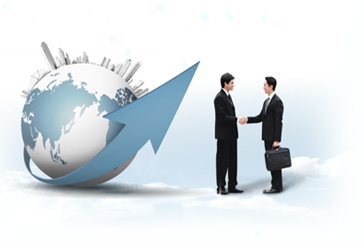 Clients from home or abroad, are warmly welcome to visit us! A: We usually quote within 24 our after got your inquiry. If you are urgent to get the price, please call us or tell us in your email so that we will regard your inquiry priority. Q4: How can i get a sample to chack your quality? A: After price confirmation, you can require for samples to check our quality. If you just need a few samples to check the design and our quality, we will provide you samples for free, as long as you afford the express freight. Q5: How long can i expecte to get the sample? A: After you pay the sample charge and send us your confirmed information, the sample will be ready for delivery within 3-7 days. The sample will be sent to you via express and arrive in 3-5 workdays. to the very end. 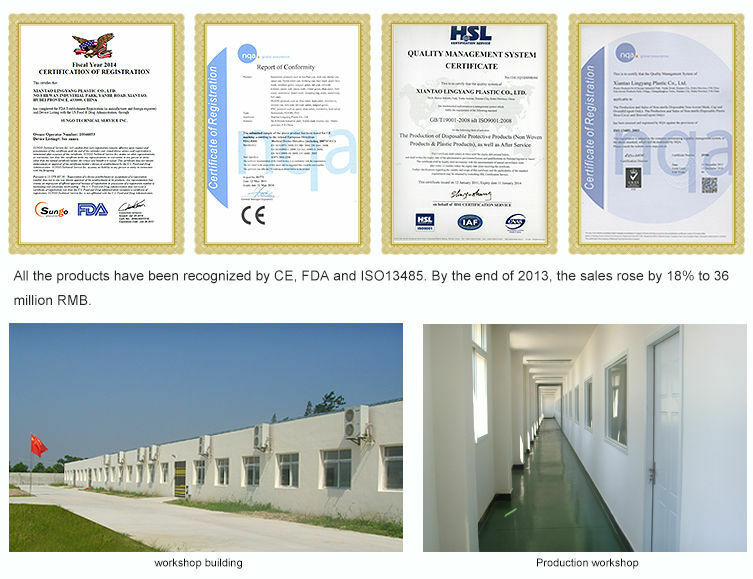 Our factory has gained CE, ISO and FDA authentication.